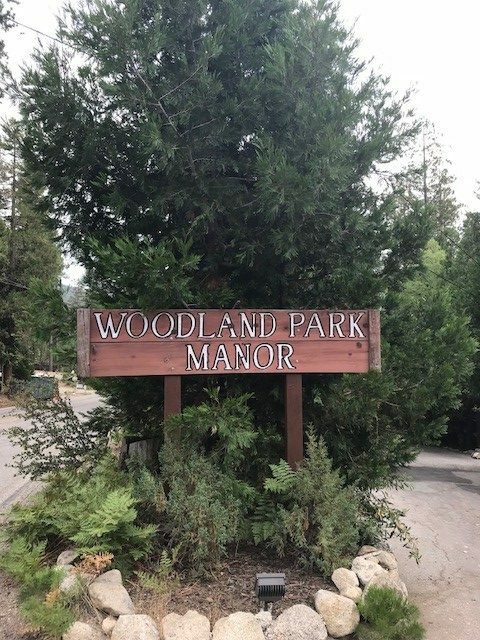 I will give you the end of the story first….Idyllwild and Woodland Park Manor are untouched by fire and as beautiful as ever! As many of you know, the Cranston Fire started July 25 near Idyllwild. We closely watched the fire’s progress, started packing a few things and within a few short hours we received the order to evacuate. We left with our important papers, guest info and, of course, our family pictures! Our hats are off to law enforcement and all who organized the evacuation….it was quick and smooth. Before we knew it, we were in Banning saying “What now?”. We spent a couple days with our daughter and then a couple with our son, having lots of fun with our grandkids, with one eye on the latest fire reports at all times! Yesterday morning, we received the news we were waiting to hear…the evacuation was lifted and it was safe to return home! WE CANNOT EXPRESS THE GRATITUDE WE FEEL FOR ALL THOSE WHO WORKED SO HARD AND RISKED SO MUCH TO KEEP OUR HOMES AND PRECIOUS MOUNTAIN VILLAGE SAFE! Sadly, a few homes on the outskirts of town were lost. Our wonderful community is barely back home and already planning fundraisers to help these families as they move forward. I cannot tell you how much we appreciate all the texts, call, emails and posts we have received from our Woodland Park Manor friends. So many expressing concern, recalling fond memories from past visits and generously offering help. YES!!! 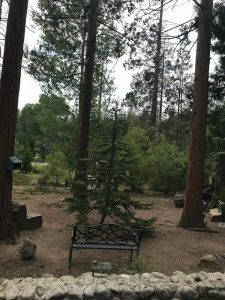 IDYLLWILD NEEDS YOUR HELP! Please spread the word that Idyllwild survived and is beautiful as ever! Let everyone know that if they would like to help, COME VISIT! All Idyllwild businesses, mostly small and family owned, will be hurt. Not only from a week’s lost income during our busiest season but also from many cancellations and lack of visitors in the coming weeks and months. It’s completely understandable…the public is left with images of fire over our mountain. Their concern leads them to change plans or just not consider Idyllwild for their next getaway. All the while, our village, lodging, restaurants and shops are unchanged, ready and waiting to serve our guests! Please come visit! For just a day, or even better, a few days! Eat in a restaurant, buy a little something in a shop, rent one of our Cottages/Cabins or camp! We need you and all of Idyllwild will be thankful! Posted in Woodland Park Manor News | Comments Off on Wow!! What a week! Fall has arrived with beautiful color! The weather is perfect…..brisk mornings and evenings, days that are perfect for a hike or just relaxing on your deck. We have had a few days cool enough to enjoy a fire in the evenings….we all love this time of year. A wonderful guest spent some time in our Cottage in the Woods this week and “zentangled” this pumpkin while she was here. Then, she generously gave us her work of art! It’s beautiful…we will have it on display in our office all season! I might even give this art form a try…..I feel inspired! Fall is also our project time. This year we are building a new entrance area outside our office…adding a walkway and new deck. We are designing a more welcoming, easier to use entrance and Matt is working hard to get it built! Colin and I just took a little time an d went out to lunch at Mile High Café. Always such a pleasure! The food is delicious and a bit above expectations each and every time. They are serving a holiday meal on Thanksgiving that includes turkey, duck, prime rib, sea bass, all the sides and desserts too! One of our guests enjoyed Mile High Café last Thanksgiving and told us it was the best restaurant meal they had ever had! We suggest visiting this wonderful restaurant next time you are here in Idyllwild. Come visit us….we have a few weekend openings before Thanksgiving and one last minute Cottage available for the Thanksgiving weekend. And, as always, we have midweek openings for a nice quiet visit at a discounted rate! Hope to see you soon…..Happy Fall! Hello, guests! It’s been too long since we have written to all of you! All is well here at Woodland Park Manor. We are in the middle of our beautiful summer season. We have had a few days of exciting thundershowers but mostly warm sunny days and cool nights! Our guests are spending lots of time by our pool in the pines, hiking and just relaxing in our cool green forest. The village area is thriving! New restaurants, galleries and shops have opened. Idyllwild Bake and Brew offers delicious pastries, coffee, sandwiches and a “Back Room” brewery with dinner.. and live entertainment. Ferro’s, Idyology, Fratellos and the new Idyllwild Brew Pub are all popular spots. 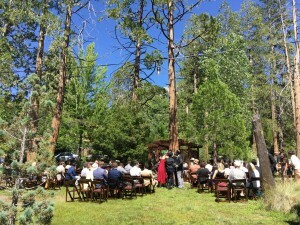 Idyllwild is a busy community! This weekend, the Art Alliance of Idyllwild is offering their annual Eye of the Artist event. 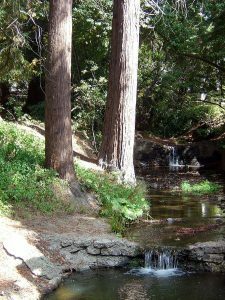 The gardens at the Idyllwild Historical Society will host working artists, refreshments, music and a judged art show with a “Landscapes of the Mind” theme. Admission is free! As I write, it is 79 degrees and sunny, with a little breeze. 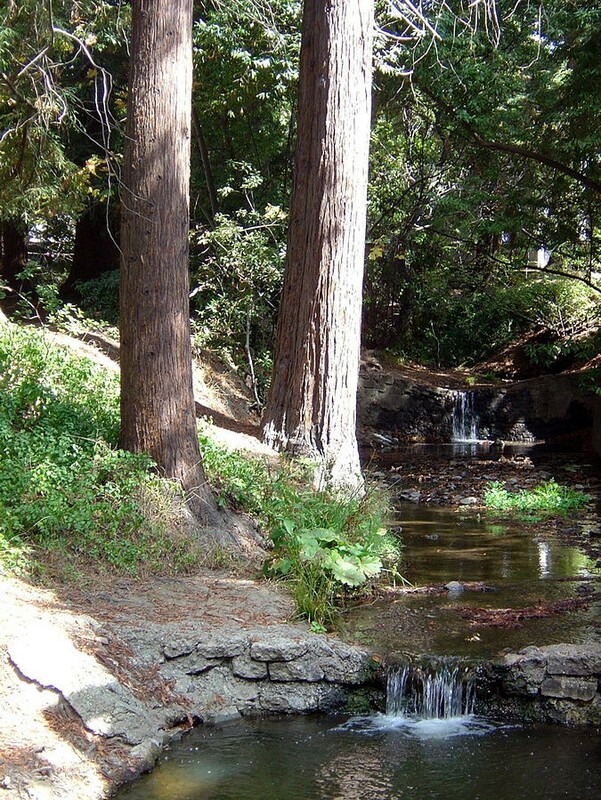 We will break away a little later and walk by the creek…just a block from us. Then, we will have dinner on our deck…..embracing summer to the fullest. We make sure to stop and enjoy Idyllwild ourselves once in awhile! Give us a call…we have openings during the week and a few on weekends too. Hope to see you all soon! Hill Top Cabin coming soon! We have a wonderful new cabin for our guests to enjoy! This cabin has three bedrooms, two bathrooms, a cozy living room, nice kitchen and dining area. It has decks all around for enjoying the beautiful views of the forest. For now, enjoy this picture of our unique new cabin, taken following our latest snow. We will be adding all the details and many more pictures soon! 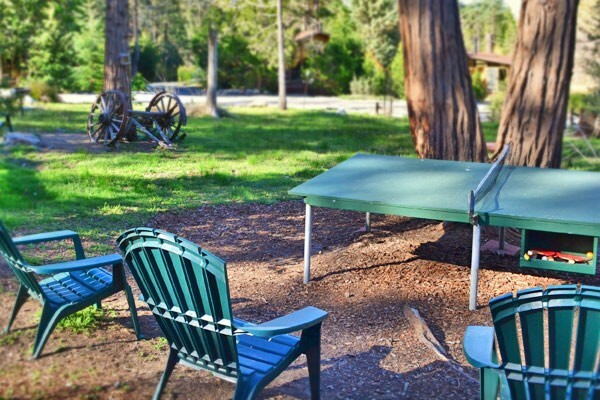 October will bring two special weekends in Idyllwild! Saturday, October 10 is our annual Art and Wine Walk, sponsored by the Art Alliance of Idyllwild. 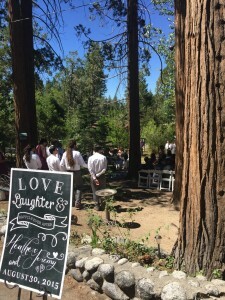 Walk through beautiful Idyllwild enjoying our galleries and artist booths tucked among the pines. Taste the wines and meet the owners of 19 of Southern California’s favorite wineries. Entertainment will be offered by local Idyllwild musicians. All the funds raised will go to Art Education. 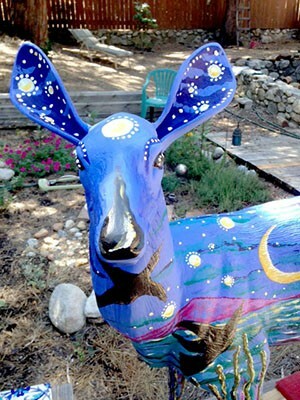 Full details are available at artinidyllwild.org Join us….it is always a beautiful day! Come up and join the fun! Posted in Woodland Park Manor News | Comments Off on Special Events! We are about halfway through our wedding season and have enjoyed every celebration! We are always excited as each wedding group arrives and we see how this bride and groom have chosen to arrange their ceremony and reception. The choices are always unique! This year we have had ceremonies around our pool and several in our park area…but each one facing a different direction! We have had formal seating, informal buffets and food trucks. Pretty lights hung in the trees, our gazebo set up with gifts and cakes, two groups have set up a photo booth in our custom phone booth! 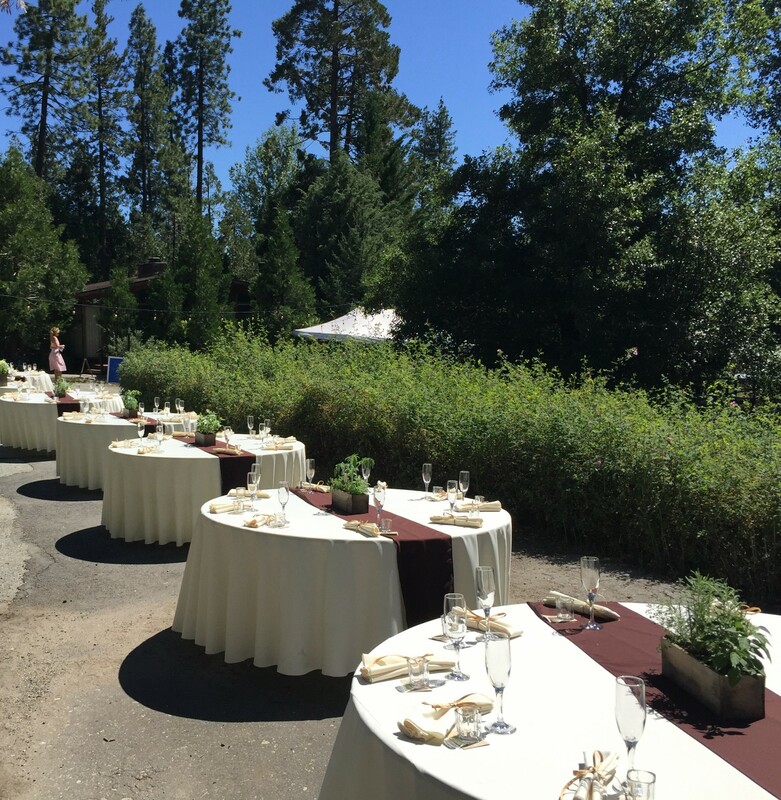 Of course, we are an outdoor venue and we always hope for perfect weather….and we usually have beautiful, sunny celebrations! However, last month, we had our very first rainy wedding! This bride and groom wisely watched the forecast ahead of time and arranged for a beautiful tent with lots of windows. Their wonderful ceremony was accentuated by a beautiful, thunderous rainstorm….and they loved every minute! 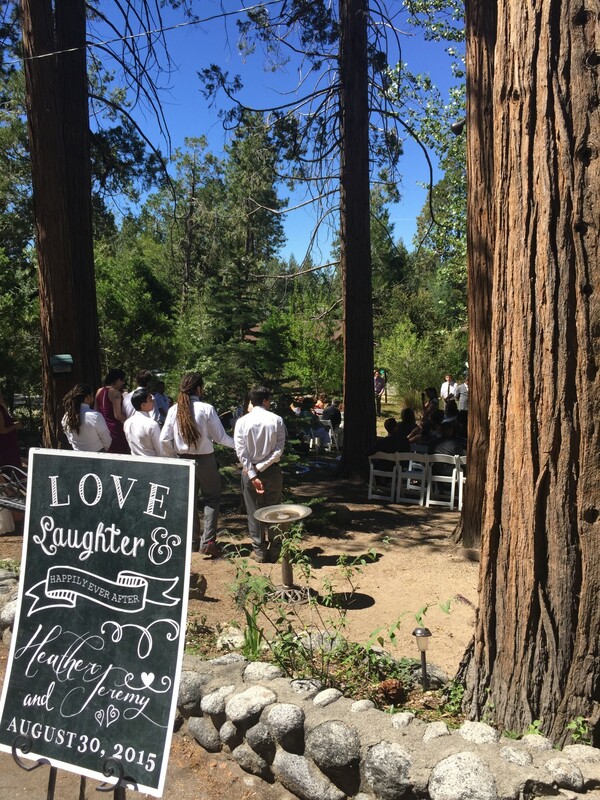 Last weekend, we watched as the wedding party coaxed the adorable flower girl down the aisle-she just wouldn’t move because she was watching our wild bunnies playing under the tree nearby! We have had deer, squirrels, always birds and even a very young raccoon visit our celebrations. 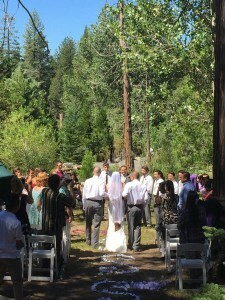 Outdoor weddings are always beautiful and often a little surprising! Well, Mother Nature has kept us guessing through the month of May! We started the month on the heals of a wonderful rain! The rain was followed by a week of warm, sunny Spring weather. The flowers were blooming, birds building nests….and then, SNOW! 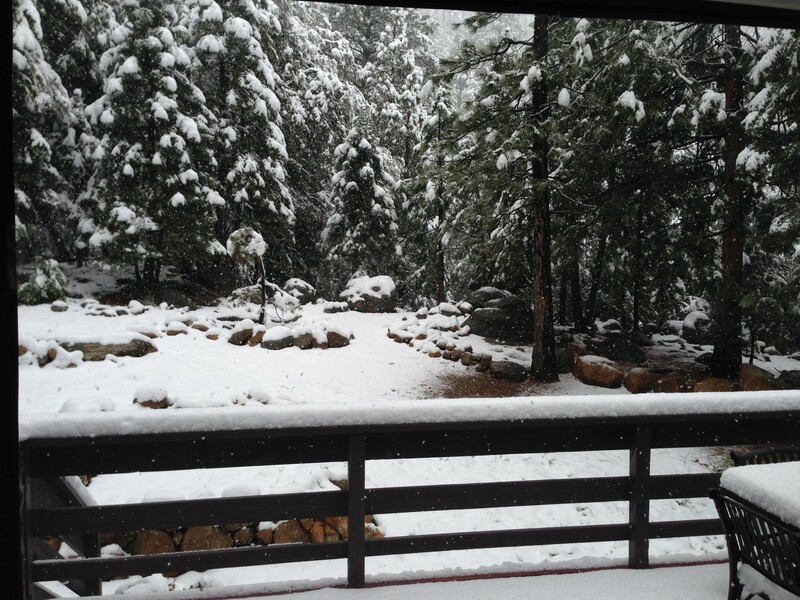 Idyllwild has a long history of a “Mother’s Day Snow”…… a light snowfall within a week of Mother’s Day. However, this was 5″ of snow and followed by 3” more a week later! All this beautiful snow set us back in our preparations to open our pool for the season on Memorial Day weekend! For the past few days, we have been putting in long hours at the pool, squeezing 2-3 weeks of work into one week, only to see this morning’s forecast for the weekend. More rain Thursday-Friday and daytime temps over the weekend in the low 50’s! Perfect hiking weather but not ideal for swimming! Either way, we are back on schedule and our pool will be beautiful, sparkling, warm and ready for summer when Mother Nature makes up her mind!! Posted in Woodland Park Manor News | Comments Off on Mother Nature!! After three (yes three!! ), light snowfalls in early May, it seems summer is finally here! We have had wonderful days in the 70’s and nights in the 50’s. Perfect for hiking and enjoying our pretty, wooded park. 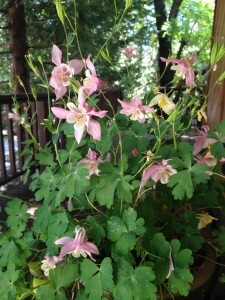 Everything is green and blossoming….Columbine is blooming beautifully down by the creek. Our swimming pool is open for the season, heated and ready for our guests. We have native strawberries and vibrant flowers growing in the planters by the pool. It is the perfect spot to spend an afternoon under the Pines. This is the season for group reservations!! We have two wonderful family groups with us each Memorial Day weekend. Thank you to the Davies and Rucker families for gathering here year after year. We are thrilled to be expecting many groups this summer. We have a wedding in mid-June and a family reunion the weekend following. We have weddings and reunions scheduled each month through October. What a joy to share in these special events with our treasured guests! We hope to do some hiking ourselves this season. One of my favorite trails is Deer Springs Trail. It is nicely shaded, crosses several small springs and ends with a tremendous view of Tahquitz Peak! I hope to enjoy lunch at the top of this trail at least a couple times this summer! Summer in Idyllwild is cool and sweet with the fragrance of pines and cedars….come enjoy it with us! Posted in Woodland Park Manor News | Comments Off on Summer! We have an amazing new Vacation Rental……Tahquitz Sunset! This Cabin is sure to be a guest favorite! 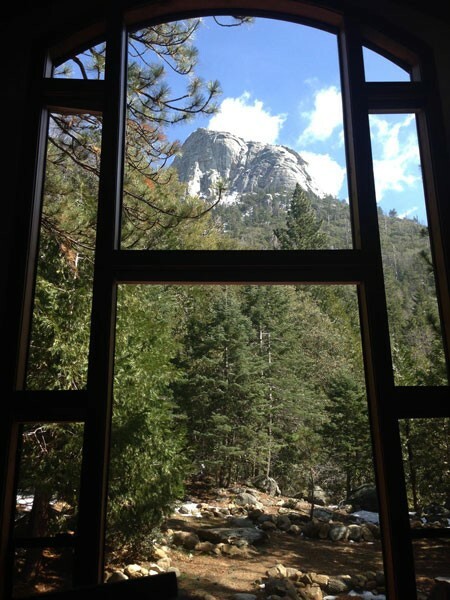 With cathedral windows offering a breathtaking view of Tahquitz Rock and the Mount San Jacinto wilderness, Tahquitz Sunset is the perfect place to enjoy Idyllwild. The beautiful view and a hot tub on the edge of the forest, make this a perfect mountain getaway! This Cabin sits high in Fern Valley, about 2 miles from the village center. It is just a couple blocks from Humber Park, where miles of trails begin. You can enjoy a simple hike on the Ernie Maxwell Scenic trail or something more challenging, hiking the Devil’s Slide trail up to Saddle Junction or beyond! The “Climber’s Trail”, up to Tahquitz Rock, is a short walk from the Cabin. Four decks offer views in every direction. The main deck, accessed through the living room and the downstairs bedroom, is near the hot tub and looks into the forest. One more downstairs deck adds an outdoor eating area right off the kitchen. Upstairs, we have another small deck near a cozy sitting area with a stunning view through the cathedral windows. The fourth deck is off the master bedroom upstairs. We have spent the last few weeks working to get everything prepared for you….Tahquitz Sunset will be available for reservations on May 1st! Look on this site under Lodging for “Vacation Rentals” and you will find more photos and complete details on Tahquitz Sunset. Give us a call or email us to be one of the first guests to enjoy this wonderful Cabin! We just returned from a wonderful lunch at one of our favorite Idyllwild restaurants–La Casita! La Casita has been a tradition with our family and friends for years. Robert and his staff serve fresh, delicious Mexican food and make us feel at home every time we visit. Today I had their specialty…a Chile Relleno! Colin had his usual…cheese enchiladas. We also enjoy their Taco Salads and Taquito Bits. We join friends at La Casita every Monday evening for Taco Night. It seems half of Idyllwild eats at La Casita on Mondays! We can always count on running into old friends and enjoying a chat. Our weather has been perfect. Fall is in full swing. The trees are full of color and the nights are crisp and cool. We have had two light snowfalls already and are looking forward to another beautiful Idyllwild winter. Come for a Fall visit….and enjoy a meal at La Casita! Posted in Woodland Park Manor News | Comments Off on La Casita….delicious! We have had our first snow! 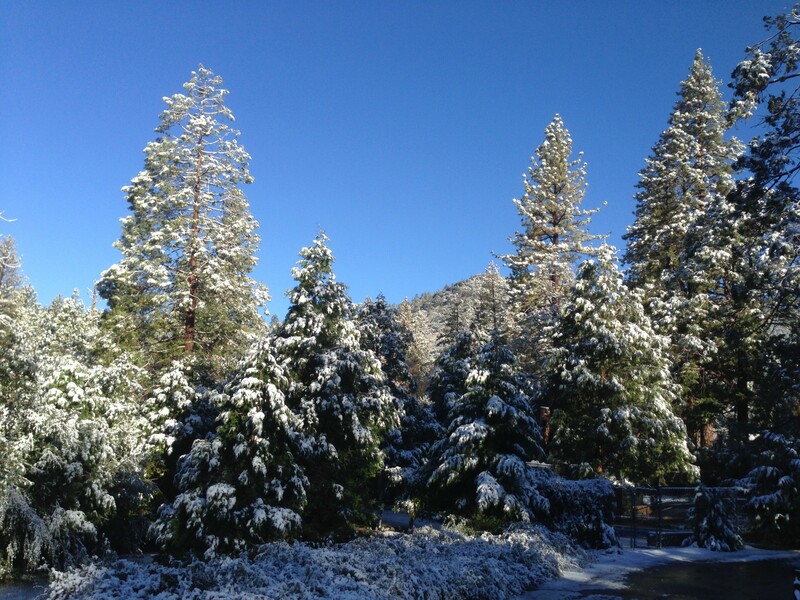 This is the earliest snow we recall in our 34 years at Woodland Park Manor. It was just a couple inches and it melted quickly but it was a promise of more to come! For now, we are enjoying sunny and cool days. The leaves are turning beautiful reds, golds and yellows. It is a great time of the year to hike, bike ride or spend time at one of our lakes. The scenery is amazing! We spent some time on the Ernie Maxwell trail last week. The weather was perfect, the Fall colors were breathtaking. We saw more birds than ever before, many squirrels, bunnies and even an elusive bobcat. It was an easy afternoon hike…..5 miles round trip. A wonderful way to spend an afternoon! This Fall the deer have been coming by our park area here at Woodland Park Manor. Early in the morning we look out and often see a family of deer munching in our park. We love it! 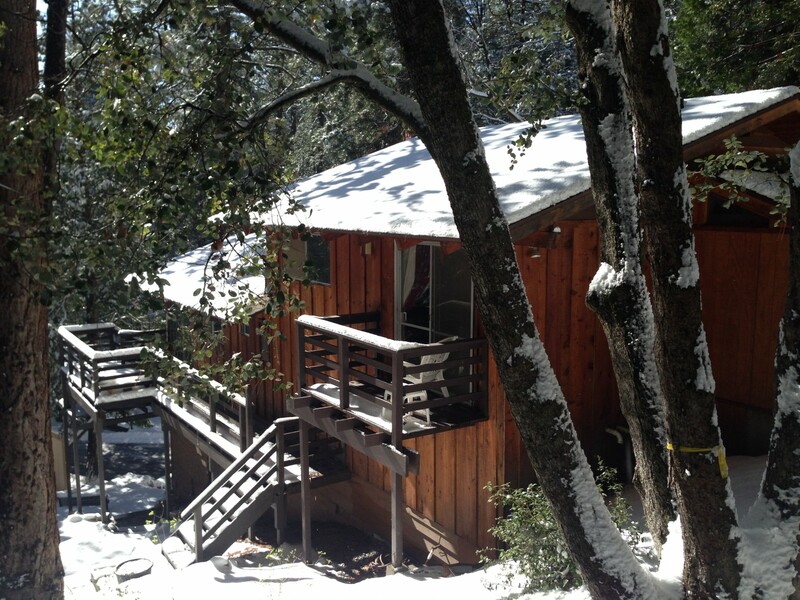 Come enjoy Fall in Idyllwild! 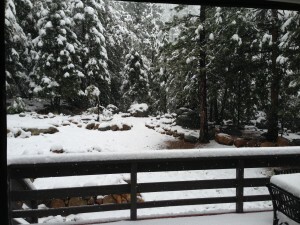 Posted in Woodland Park Manor News | Comments Off on Snow! Beautiful weather and two Special Events!! We have had a week of wonderful thundershowers!! Plenty of rain and fresh, cool temperatures! The forecast calls for sunny clear days this weekend. Come enjoy time in our mountains! Our Idyllwild Art Alliance is offering a once in a lifetime opportunity this Sunday. The are gifting our community with a herd of 22 deer sculptures….each uniquely painted by a local artist. Each deer will reflect a different aspect of Idyllwild, from local history to natural beauty to hiking our beautiful trails! The herd will gather one time only–this Sunday, Sept 15–at Forest Lumber from 11:00-1:00pm. After the gathering, each deer will be placed in a special location around our village. And, remember, Saturday, Sept 14, is our annual Home Tour! 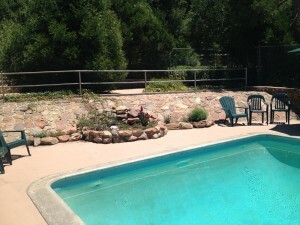 This is a wonderful opportunity to tour some of the most amazing homes in Idyllwild. This year’s homes range from historical to contemporary. 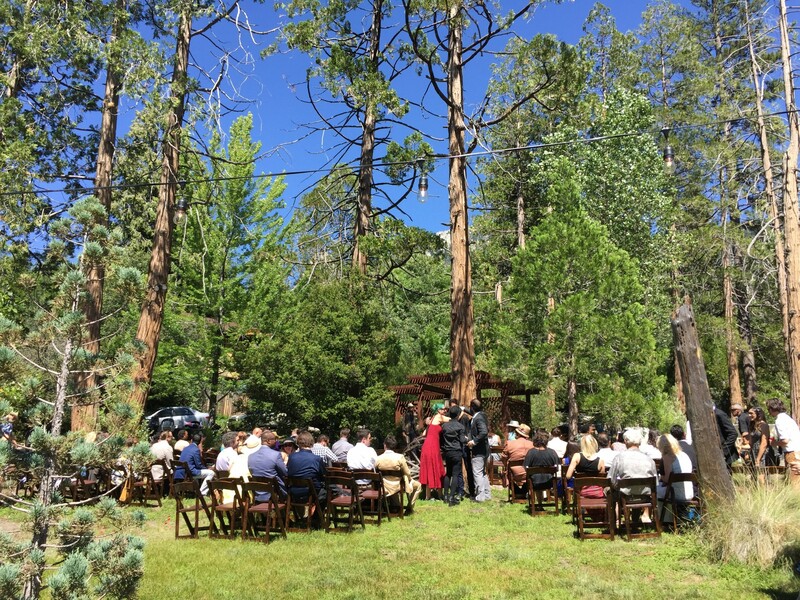 Sponsored by the Idyllwild Historical Society, this annual tour is always a guest favorite! Join us for beautiful weather and unique fun this weekend! 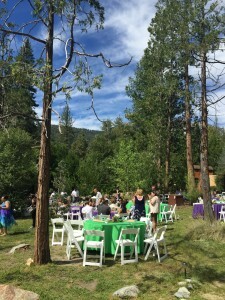 Posted in Woodland Park Manor News | Comments Off on Beautiful weather and two Special Events!! Summer is coming to a close….but we have much to offer before it is over! Labor Day weekend is coming up and it will be wonderful! The forecast is for pleasant, sunny days and cool evenings. Most of our wilderness area is open and guests are enjoying time on the trails. 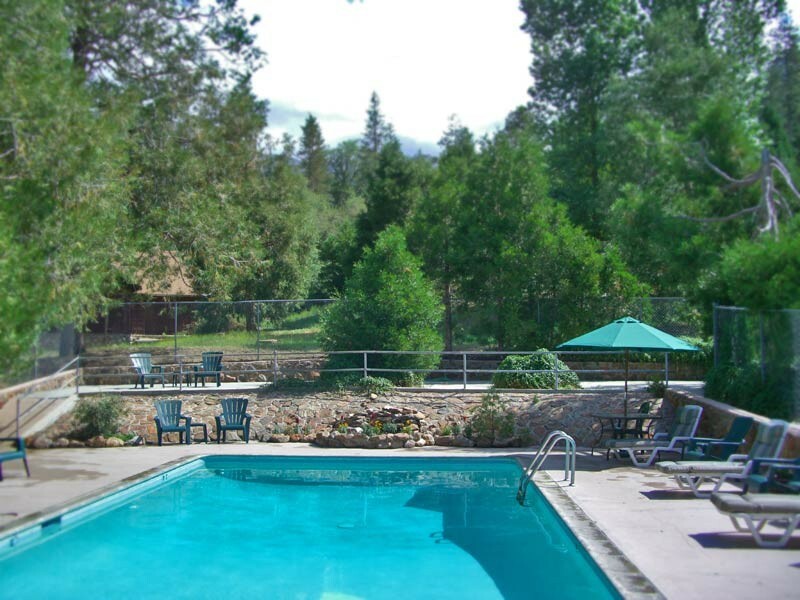 Our Pool in the Pines will be open for a few more weeks….until Fall weather arrives! Labor Day weekend also offers many yard sales for another kind of “treasure hunting”. Mile High Café, Café Aroma and the Idyll Awhile Wine Shoppe are among the restaurants offering live music. If you can’t make it up for Labor Day, consider another weekend in September. The Idyllwild Historical Society is offering their very popular, annual Home Tour on Sept 14. This year’s tour includes 5 homes ranging from 1920’s historical cabins to a contemporary masterpiece by well known architect Dennis McGuire. This tour is always a guest favorite. And a favorite of ours too….Colin and I will be there! Posted in Woodland Park Manor News | Comments Off on Summer’s End in Idyllwild!! Our annual Jazz Festival is coming up this weekend! Idyllwild Jazz in the Pines offers an amazing weekend of great music, a Dine in the Pines Food Court and unique work from over 50 artisans available for sale. This year, we are thrilled to have our own Casey Abrams performing on Sunday. Casey grew up in Idyllwild and has gone on to fame and fortune—starting with his much loved time as a finalist on American Idol. The Jazz Fest will showcase more than 2 dozen music groups performing in 3 different venues. Move between the French Quarter, Stephens Recital Hall and the beautiful Holmes Amphitheater to hear Straight Ahead Jazz, Latin, Rock, and Blues. Bring a blanket or lawn chairs and sit beneath the Pines and Cedars to enjoy great entertainment in the gorgeous natural setting of the main stage in Holmes Amphitheater. 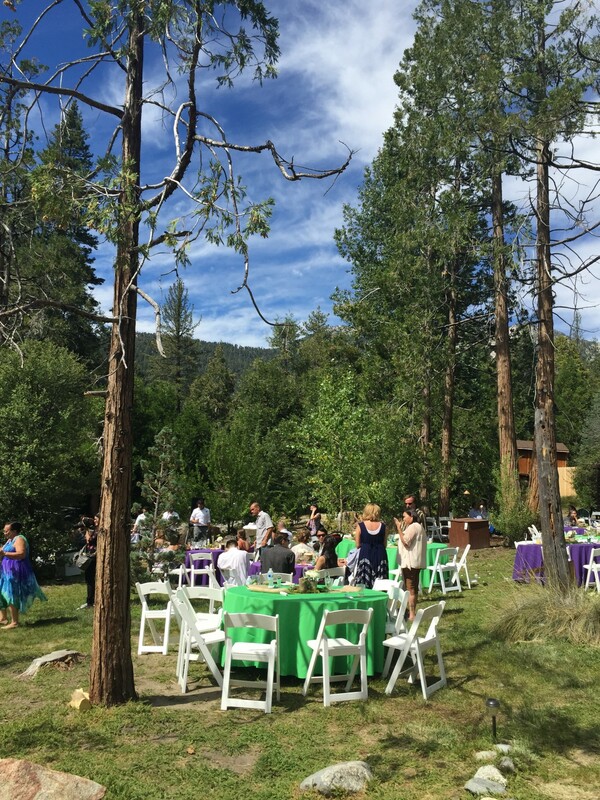 This event is a fundraiser for Arts Education at Idyllwild Arts Academy and Summer Program. Help support Arts Education and enjoy a one of a kind weekend in Idyllwild! We have just a couple openings left so give us a call…..we would love to have you join us for this special weekend! We are home, sweet home! After a challenging week, including 5 days of evacuation due to the Mountain Wildfire, we are back! We drove home yesterday through wonderful, wonderful rain. And, it just started raining again! Most amazingly, there is no ash, no soot, no debris! Idyllwild is as beautiful as ever. We are so very thankful! Creek Cottage, Fernwood, Point of Rocks, Ridge Dome, Stonewood, Feather Ridge and Norwood Pines. For our guests with pets…..
For your pet’s safety and the safety of our native wildlife, ALWAYS keep your pet on a leash! Please do not leave your pet alone in your cottage or cabin unless they are crated. Please keep pets off the beds and furniture. Pets are not allowed in the pool area. Sorry!